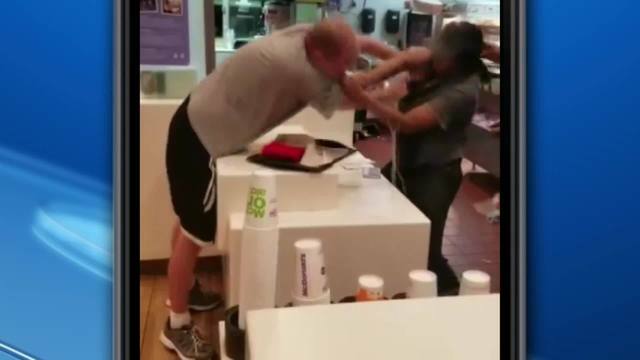 ST. PETERSBURG, Fla. (WFLA) - A video of a fight between a customer and an employee at a McDonald's in St. Petersburg is going viral on social media. Daniel Taylor was arrested New Year's Eve on two counts of simple battery. According to the affidavit, Taylor was in McDonald's around 6:50 p.m. when he reached over the counter and grabbed an employee, Yasmine James, by her shirt. Another customer took cell phone video of the fight, where Taylor is seen grabbing James first. James then punches Taylor multiple times. The video has over a million views on Facebook. Police were called after Taylor was told to leave. According to the arrest report, Taylor kicked another employee, Tateona Bell, in the stomach. Bell was holding the door as Taylor was being escorted out by management.